rTorrent is a text-based torrent client, based on the libTorrent libraries from Unix. According to the rTorrent author, Jari Sundell (a.k.a. rakshasa), the goal of rTorrent is… “a focus on high performance and good code“. ruTorrent, on the other hand, is a powerful web front-end for the command line based torrent client “rtorrent”. It allows you to create, upload and manage all your private torrents in one place. ruTorrent is designed to emulate the look and feel of µTorrent WebUI so it’ appearance is quite similar to the “parent”. The name “RuTorrent” is the combination of µTorrent and rTorrent. (Seedbox Guide). Very light and made strictly for performance. Extensible and has many custom plugins. Supporting all major browsers platform. Setting up rTorrent on a Virtual Private Server “VPS” is so convenient because you can connect and download torrents using ruTorrent’s amazing WebUI. rTorrent client is popular for being highly stable, efficient and flexible. If the application can’t do something, the library of rTorrent plugins might have what you looking for. ruTorrent Web-based GUI uses rTorrent for almost all operations and brings plugins into the table, resulting in a highly usable, feature-rich and powerful torrent application. The software is ultra light so you can install it on servers with low resources and even on Small Office Home Office “SOHO” routers. Many of our Seedbox clients choose ruTorrent as their favorite client since it’s reliable, convenient and very easy to use. 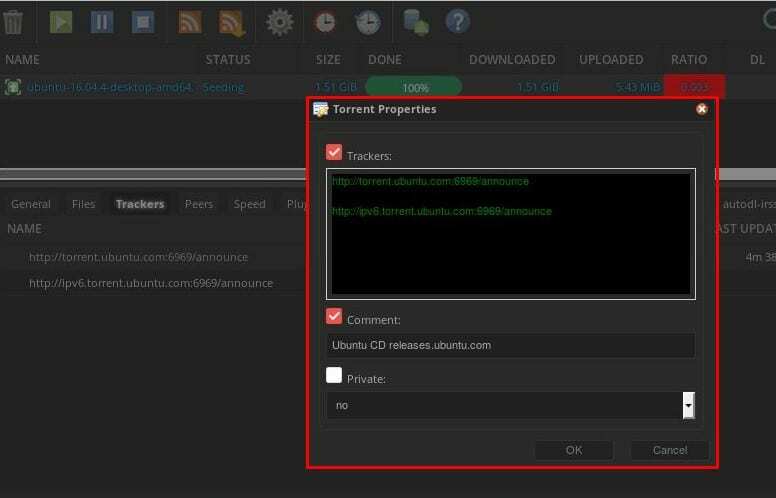 In this tutorial, you will learn how to use ruTorrent and why it’s such a popular client in our niche. The following commands will download the latest versions of ruTorrent, rTorrent and plugins. Start by downloading them right from the GitHub repository. The commands were executed in Ubuntu 16.4. They will download the package, delete the packaged plugins directory and install the plugins from the repository itself. rTorrent and ruTorrent take full advantage of the command line interface of Linux and are the perfect choice for any kind of server. That is why they are commonly used in Seedboxes. Our Seedboxes come pre-configured with ruTorrent and are ready for seeding. But you may also decide to go your own way and use a VPS with high resources (if you are Linux savvy). Our VPSs come in different flavors, so you may easily find what suits you best. If your goal is to run ruTorrent from scratch, you have to install rTorrent beforehand. Fortunately, all rTorrent packets are available on multiple Linux distros. There is no installation or compilation process needed for ruTorrent on Ubuntu, but you need to install other dependencies to make it work, like rTorrent, libtorrent and XMLRPC. The sources are cloned/unpacked into a directory which is set up as document root of a web server of your choice (for detailed instructions see the web server wiki article). From one of our Seedboxes. The fastest and easiest route is to use one of our already deployed Seedboxes with ruTorrent. Remember that the objective of a Seedbox is to have maximum upload speeds and improve ratio in a tracker. Installing ruTorrent into a VPS. You may decide to experiment yourself and install rTorrent and ruTorrent from scratch into a VPS. The following section will guide you through the steps and resources to help you install your own ruTorrent server. The installation/configuration of this application into different distributions of Linux is pretty similar. There is usually no GUI in an Ubuntu Server, so what is really convenient about ruTorrent client, is that it can be managed via WebGUI. If the server that you intend to set up will be dedicated to rTorrent/ruTorrent, make sure the system is hardened and secured. Do not use the root user; instead, create a new user with super privilege. Begin by updating your platform to the latest version. Install “Apache and PHP+7: You need Apache and PHP to allow access into ruTorrent’s WebGUI from anywhere. Apache is available within Ubuntu’s default repositories, so you can install it using traditional package tools. Install Web Server dependencies: “XMLRPC, libtorrent, and rTorrent”. Install and configure rTorrent: Ubuntu 16.04 has a version compiled with SCGI support, so you can install it directly with the following command. Create the following directory where rTorrent will store its data. Edit rTorrent’s config file. Change .rtorrent.rc with nano “nano ~/.rtorrent.rc” and edit the following info. Security: Set up a basic password protection and permission for htpasswd file. ruTorrent and rTorrent are native to Linux OS. But that doesn’t mean you have to forget about Windows OS here. There are still a couple of ways to make it work on Windows OSs. The following link from SmartHomeBeginner is a great step-by-step guide that shows you how to install ruTorrent using Docker containers. Supposing that Docker is already installed in your Windows OS machine, this might be the easiest way to run ruTorrent in a Windows. Another great guide from RTW, will show you the step-by-step process on how to install rTorrent on Windows using Cygwin. This tool provides similar functionality of a Linux Distro in Windows OS. Open your ‘Welcome’ email that contains all credentials for your product. Navigate to this link and you will be prompted for credentials (see screenshot below). One of the first things to notice is a menu bar. We will also, explain step by step what is the purpose of every button. This button is for adding torrents. This particular button will allow us to create new torrents. “Delete” button. With this button, we can delete single or multiple torrents. Start” button role is to start downloading/uploading torrent/torrents. “Stop” button we can use when we want to stop all activity on particular torrent. “RSS feed” button for creating RSS feeds. “Autodl-irssi” plugin for monitoring our trackers Announce Channel and to automatically start downloads for you based on our filters. “Settings” button where we can change all of the ruTorrent settings. “Help” will show us some basic shortcuts. 3.2 How to load a torrent? “Directory” – The path where torrents will be downloaded. “Label” – If we want to customize our torrent label, we can use this option. “Torrent file” – If we have downloaded .torrent file, we will use this option to locate that file, and load it. “Torrent URL” – The URL of magnet link. 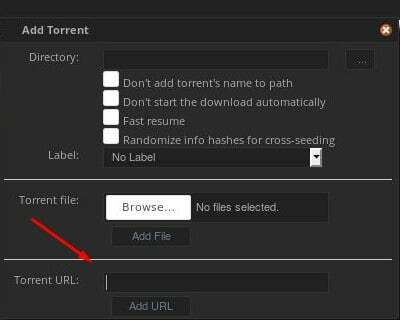 3.3 How to create a new torrent? “Select Source” – Here we can determine a destination where our file is located. “Trackers” – At this text area, we can add trackers separated by one blank row. Note: When using a private torrent, you can only add one tracker. “Comment” – We can add an additional comment if we want. This option is not necessary. “Start seeding” checkbox is, also optional if it is selected ruTorrent will automatically start seeding after the torrent is created. “Create “ as a title says, create a new torrent. When you select particular torrent (like on the picture), you can notice down below all info related to that torrent. You can see many tabs monitored in the real-time, General, Files, Trackers, Peers, Speed, Plugins, File Manager, History, Tasks, Traffic, Chunks, Autodl-irssi, Log. You can find a size about that particular file, and how much data is remaining to be downloaded. “Trackers” tab will show info regarding currently loaded trackers, their name, protocol they use, status, group, how much Seeds/Peers are using that particular tracker, Download status, when is the time of the last update, the interval and information is a tracker private or not. “Peers” tab is showing a real-time info about connected peers, their country, speed and much more. This is managed by a plugin called ”show_peers_like_wtorrent”. “Speed” tab represents real-time speeds for downloading/uploading a torrent data. “Plugins” tab is pretty self-explanatory. It shows currently loaded plugins for RuTorrent. We can unload particular plugin or enable/disable it. “File manager” tab is shown if file manager plugin is loaded. It provides basic navigation for our root directory where torrents are downloaded, usually, a root is our /home/ dir. “History” keeps a track of all torrents downloaded/uploaded for our session. We can be clear it if we select all rows (or via CTRL+A) , and delete it by Right Click/Delete. It is loaded by a plugin named ‘history’. “Tasks” is keeping track for our session, about operations that we had done in the File manager. “Traffic” is showing real-time statistic info for a specific tracker, in a shape of a formatted graphics chart. “autodl_irssi” tab will only be shown if an autodl-irssi plugin is installed and configured. This tab is showing log information about autodl-irssi, and provides basic operations regarding this valuable plugin. “Log” tab is the most usable tab for debugging our ruTorrent related errors. It the errors exist, like misconfigured or not working plugins, or if there is an error in communication between rTorrent and ruTorrent, loaded torrents, and everything else, the output will be displayed in this tab. If we want to clear up those messages, we can click on ‘clear‘ button. Search can significantly reduce your searching time for torrents. You can filter your results by clicking on drop menu (“All in the picture”), and you can choose different torrent sites from where you can narrow your search or select all source for searching. On the other hand, you can also search for torrents that are stored locally by selecting “Local Torrents”. The Bottom menu bar was added in ruTorrent 3.0. It shows general “total” speed information and can be used to set the server Throttle level. Also shows remaining space if you have “Plugin Disk space” installed. Hint: Our best practice is to keep 5% of free space, to prevent your torrent client from freezing. Should you ever see a warning as shown below, please remove some space by deleting unnecessary torrents. The left side menu is designed to provide a quick info about loaded torrents. It provides information about the current state of loaded torrents. “Completed” – Total torrents that have been completed. “Active” – Sum of torrents that are currently downloading/uploading. “Inactive” – Status of torrents that are currently stopped. “Error” – If for example there are torrents with no seeders, it will be marked as an error. “Labels” – We can label our torrents with a different name, hence to that, labels will be shown here. “Search” – The results from our most recent search will be displayed here. “Trackers” – Displays currently loaded trackers. “Feeds” – If our RSS feed is set up, feeds will be displayed here as well. The reason why ruTorrent is so valuable is that it is the only torrent client that can manage RSS via a Web GUI. 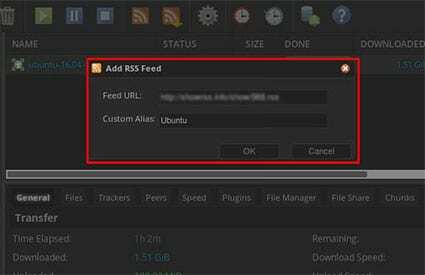 The following step-by-step guide will show you how to optimize ruTorrent to download torrents from RSS feeds. Step 1. Add RSS feed to ruTorrent.It is recommended to add an RSS feed that has direct downloads and does not require cookies. Find the right RSS feed online. Go back to the ruTorrent client and click on the “RSS downloader” icon as shown below. Step 2. The following “Add RSS Feed” window will come out. Input the “RSS Feed URL” and an alias name for the RSS Feed then proceed to click Ok button. After a while, your new feed will appear in the “Feeds” list of the bottom left corner. It is tempting to have a do-it-all type of client, but the more plugins you install the longer ruTorrent interface will take to load, and the slower it will be. As a best practice, install only what you need. A quick search in “ruTorrent plugins library” online may point you in the right direction. Plugins can be added to ruTorrent just by adding the plugin directory into the ruTorrent’s directory. It is really straightforward and easy to install plugins via the command line. Let’s say that you want to install a plugin from Novik/ruTorrent library. Step 1. Connect to your client. You can connect to your client via SSH . Step 2. Check the list from Novik/ruTorrent library and record the name of the desired plugin. * Be aware that some plugins, may not work with the previous method, you might have to check the instructions on the plugin readme file. Our Seedboxes are already optimized for crazy fast speeds. But sometimes there are circumstances that are beyond our hands. Which are factors that may affect your speed? Internet (your ISP) download/upload speed, download/upload speed limits and health of the torrent. These factors can be analyzed and optimized to improve the overall ruTorrent speed. Changing port on the ruTorrent client doesn’t make a difference, because either way all the traffic is encrypted in a VPN. For the same reason, you don’t have to worry about ISP throttling and Firewall blockage, because the connection from your resources to the VPS Seedbox is also encrypted. No need to use VPN or proxy between yourself and the Seedbox. All “torrent traffic” is between the Seedbox itself and the Internet, your ruTorrent WebUI traffic (port 80) between your computer and the Seedbox is unnoticed and un-harmful for the ISP. 4.1 Your own broadband and net speed. This is obvious, but most of the time overlooked… Make sure that the ISP is giving you what you are paying for, your computer is not limiting the speed or a bug might be eating up your bandwidth. Step 1. 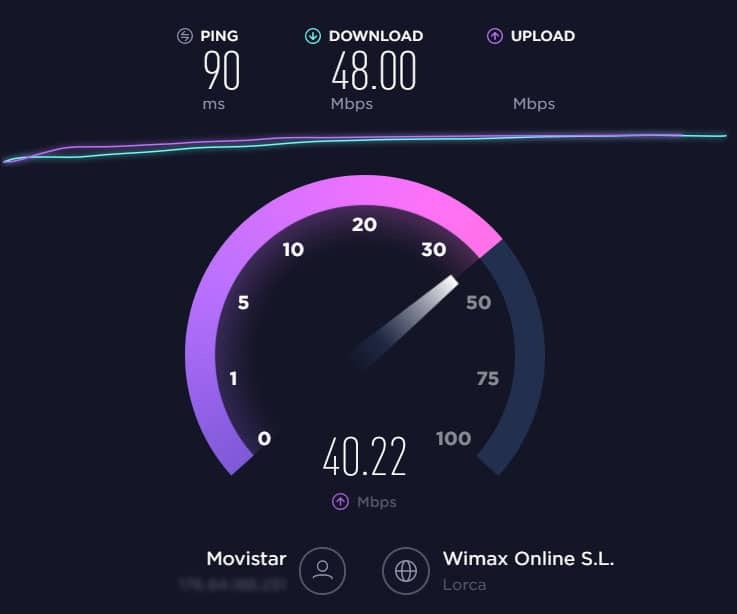 Test the maximum upload and download speed from your computer through your ISP (not the Seedbox/VPS). Go to Speedtest and click “Go” to test your speed between your computer and the Internet. Is it the bandwidth your ISP is offering? Step 2. Some processes in your computer might be consuming precious bandwidth. Whether is a background intelligent transfer service, daily backup to the cloud or an antivirus automatic updates, all of these consume bandwidth, which makes your torrent transfers slow. 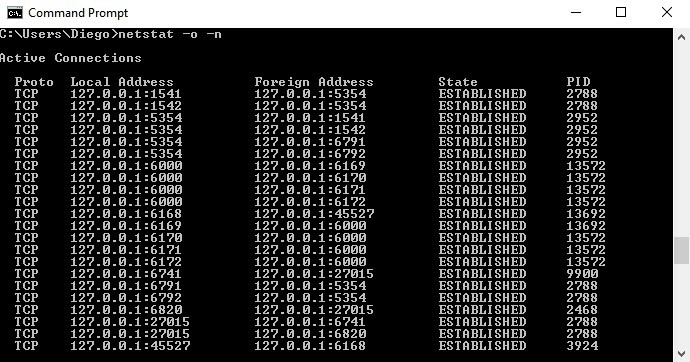 On Windows, you can use NetStat to see what is using your network resources. Go to cmd.exe and type, “netstat –o –n”. From that list, find the Process ID “PID” with the most connections. Record the PID, go back to Windows Task Manager and find the same number. Shut down the process if you are not using it. In Ubuntu, you can use a tool called nethogs. Install it with the following command. Step 3: An active bug will surely make your torrents slow. Make sure to keep all Anti-Malware updated, and your computer scanned with latest Virus definition. Make sure that your speed is not limited, by changing or making sure that its default value is set to “0”. Go to Settings > Connection > Bandwidth Limiting. Make sure that maximum upload and download rates are set to 0. For whatever reason, do not to limit upload rate. BitTorrent protocol uses an algorithm called “choking” to make sure that sharing is fair. If you limit the upload speed too much or use a different algorithm that is “unfair”, other peers in the swarm will not cooperate and you will immediately get “choked” until you do not receive any data. The more peers are in your swarm the more speed you will receive. 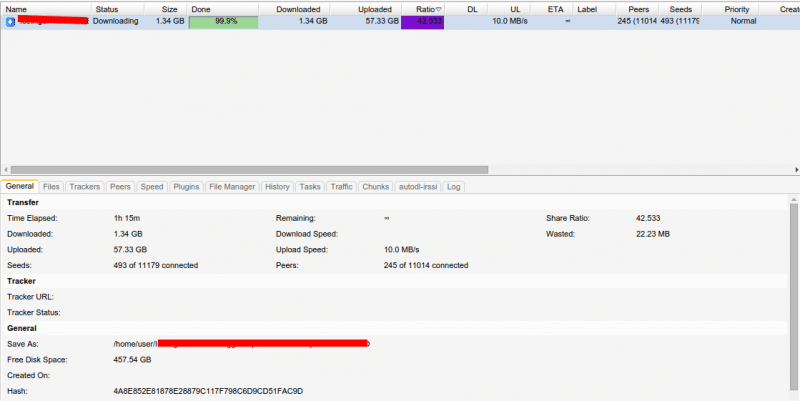 Your download speed can be also “directed” by the health of the torrent. In other words, the number of seeders in the swarm and the availability of the torrent trackers make your torrent download faster or slower. How to analyze the health of a torrent before downloading it? Step 1. Check the seeder/leecher ratio before-hand. This ratio may vary, so you may have to come back later if you see a low ratio or very few seeders. You might see that before downloading any of the following torrents, a quick look into the S/L (Seeders/Leechers) columns might give you a lot of information on the health of the torrent. The higher the number on Seeders, the greater the chance to download your torrent fast. In the following picture, the S represents “Seeders” and the L “Leechers” for each torrent. Step 2. Checking whether the torrent trackers are available. Torrent trackers are the main servers that regulate P2P traffic. They keep information about each client using each torrent so they are capable of speeding up the seed discovery process. Unfortunately, sometimes trackers experience downtime and remove torrents if they are older than a year. Use multi-tracker torrents: You can find torrent tracker lists online and update your torrent with this information. If the first tracker on the list fails, then the torrent will use the next one and so on. By going to the “Tracker” label on the bottom menu, you can see information such as the name of the tracker, type, #seeds, and peers. Update trackers: In case that trackers are disabled or with low seeds, you can update the tracker on the torrent, by right-clicking on the torrent > “Update Trackers”, as shown in the picture. You can also update the list and add more trackers so that the torrent can have higher chances to find more peers and download the torrent faster. To do this, you can right-click on the torrent (as shown above) and click “Properties”. The following window will appear. Find updated torrent tracker lists online and update your torrent. Copy the entire list and paste it right below the last tracker. 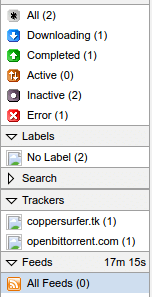 Do not remove existing trackers and leave a blank space between each tracker. Make sure DHT is enabled: Distributed Hash Table “DHT” is a tracker-less method. In DHT, the peers of the P2P network keep all the necessary information for peer discovery to themselves; they don’t need a centralized server to search for other peers. 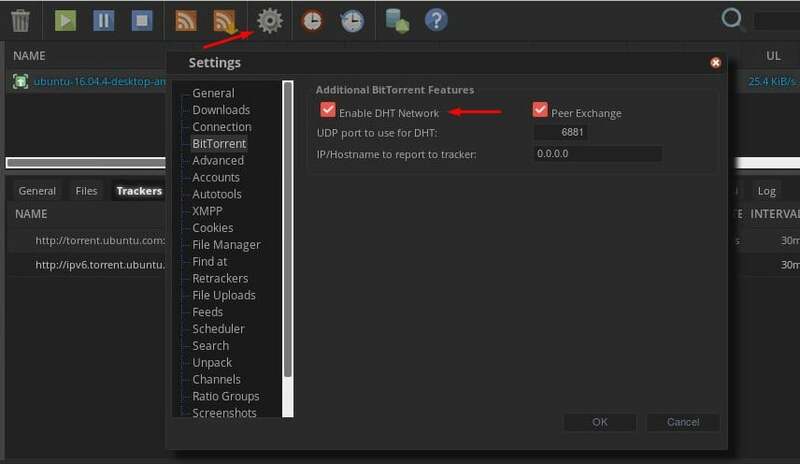 Go to settings > BitTorrent (on the right-hand side menu) > Make sure that “Enable DHT Network” is selected (as shown below). * Note that most private trackers require you to disable DHT and/or Peer Exchange. If you already dealt with external factors such as your Internet download/upload speed, there are some parameters that can be optimized internally. The following commands will help you improve speed and anonymity in your rTorrent server. These commands have all been tested in Ubuntu 16.4. Log into rTorrent and edit the rTorrent’s config file using nano (or your favorite text editor). Change .rtorrent.rc default values in the text editor with the following information. Global upload and download rate in KBps. Set 0 for unlimited. For security, check hash for finished torrents. Define encryption parameters, do not force encryption. Enable DHT and define the port. Be aware that some private trackers require you to turn DHT off. Enable Peer Exchange. The same as above, make sure this is a requirement by the private tracker. Finally, save the file and make sure to save it in the (/home/User) directory. 6. Bonus ninja ruTorrent tricks! 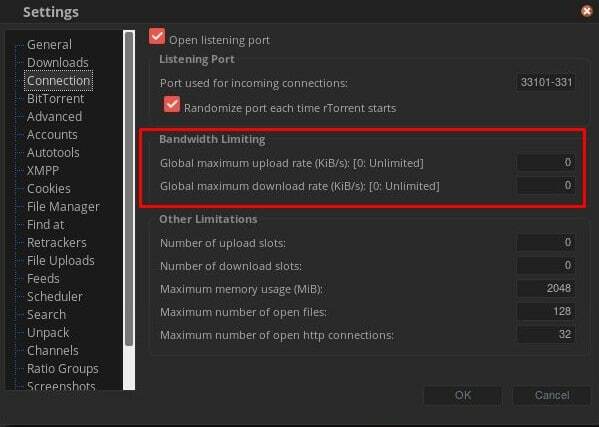 The following ninja tricks are methods to will optimize your experienceto the next level in ruTorrent. Whether is to directly share files with your friends through the application, or downloadtorrents automatically. If there is a trick that you think is totally amazing in ruTorrent, please don’t forget to mention it in the comments below. Share a file among a group of peers, or swarm is the basis of BitTorrent. ruTorrent goes beyond that and allows you to directly share a file with a friend or specific peer. Step 1. Go to your “Completed” torrent downloads, click on the file that you want to share to manage it, and go to “File Manager” at the bottom bar. This action will display all your files present at the “/Downloads” file or whatever name you gave it. Step 2. After you find the file that you want to share, right click on it and choose “Share”. A new window “File Share” will pop up. Make sure that the file you intend to share is the correct one, in the field “File”. You can define the Duration that the file will be available for sharing, this is mandatory. As an additional option, you can determine a password to add up security for the file. Step 3. Go to “File Share” in the bottom bar, to see all your shared files. Copy the “Download Link” and the password (in case you created one) and give to your friends. Step 4. From your friend’s computer. Take the link and copy it on the add Torrent URL. The file will start to download to your friend’s computer. 6.2 Auto-magically download torrents with Autodl-irssi. Autodl-irssi does it all. It is a plugin for irssi that monitors IRC torrent announcement channels, automatically downloads torrents based on a pre-defined filter and sends the torrents to a remote ruTorrent client. 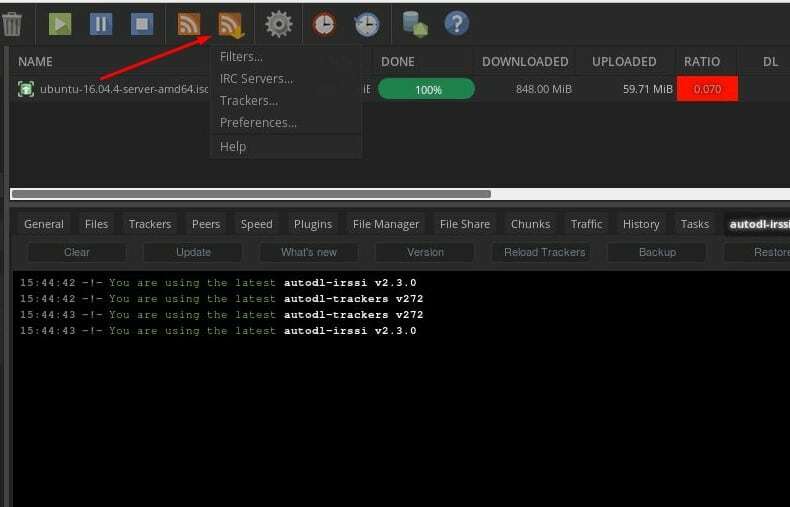 Although “autodl-irssi” is already installed in ruTorrent from our Seedboxes, you might want to learn how to install it from scratch. And how to configure it? To download anything automatically with autodl-irssi, you would need to define 4 basic parameters. Define the action to be taken. Go to the icon with the RSS icon and the yellow arrow on the top bar or the dashboard. There you will find 4 different options, Filters, IRC Servers, Trackers, and Preferences. Fro extra help, check out our extremely complete step-by-step guide on how to configure autodl-irssi from beginning. We know that this guide is just the tip of the iceberg. You might never have enough with ruTorrent and rTorrent. That is why we gathered the best resources online that cannot go unnoticed. The following links will help you keep up with these two amazing torrent tools. Arch Wiki: rTorrent; Complete rTorrent guide with installation, operation and troubleshooting. Official Upstream URL: Novik/ruTorrent; Installation and configuration of ruTorrent. Terminal 28: Installing ruTorrent; The most complete guide on how to install and configure ruTorrent, libtorrent, XMLRPC and Screen in Ubuntu. Rakshasa: rTorrent user guide; The updated and best rTorrent user guide from the official author itself. rTorrent is not for everybody. It requires extensive Linux expertise and does not have a cute native graphical interface. If you want to keep rTorrent’s crazy-high performance but introduce a GUI, ruTorrent is your best choice. It is the best choice for all Seedboxes… for a good reason. You don’t have to go through the whole install process, give a Seedbox with ruTorrent a try today! And finally, we hope that you found this article useful and that you have all your questions answered. ruTorrent is a great Web-based torrent client that should tend to all your peer-to-peer needs.